Defy Interior Finish is a durable water-based finish for log cabins and wood homes. Formulated for interior use, Defy Interior is non-yellowing, fast drying, and a low odor finish that will protect and enhance interior wood. 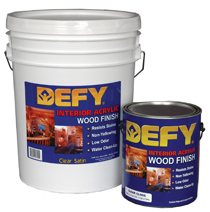 Used on all unfinished interior wood, Defy will make cleaning the wood simple and easy with a mild cleaners such as soap and water. DEFY Interior Acrylic Wood Finish can be used for log home interior walls, furniture, trim, paneling, doors, cabinets, etc. Wood Decks 200-300 sq. feet per gallon for 1 coat.